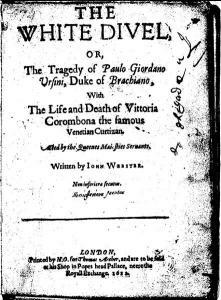 The White Devil, John Webster’s first revenge tragedy, was published in 1612 and based on a true story which took place in Padua at the end of the 16th century. The original story involved some of the most prominent noblemen of the Italian peninsula, the Duke of Bracciano, his wife, Isabella de’ Medici and Felice Peretti, later Pope Sixtus V. Vittoria Accoramboni was a poor noblewoman from Venice, who – according to poets and historians of the time - enchanted every man with her extraordinary beauty. Paolo Orsini, the Duke of Bracciano could not resist the temptation either, and first made Vittoria his lover, then organised the murder of his own wife and Vittoria’s husband. Both deceased spouses, however, had powerful and politically influential relatives who sought revenge: Bracciano’s wife was a member of the Medici family, whereas Vittoria’s husband was Pope Sixtus V’s nephew. In the end, revenge was taken only on Vittoria, who was killed while she was praying in 1585. Although Webster’s tragedy tells this story from the first meeting of the adulterers until their death, many of the historical facts and almost all characters’ names were altered by the author. Several commentaries and books were published about Webster’s sources for the drama and his use of them, the most widely praised and cited is Gunnar Boklund’s The Sources of The White Devil first published in 1957. In this monograph Boklund describes and analyses all the available historical data for Webster, nevertheless, he does not attempt to give an explanation for the alternation of historical names. He especially neglects the most striking example of name change in this work of art: Cardinal Montalto, later Pope Sixtus V is called Cardinal Monticelso in the drama, and when in Act IV Scene III he is elected to be the next pope, he chooses the name of Paul IV. Both these popes were historical characters, however, Paul IV could have never met the original story’s and the drama’s protagonist, Vittoria Accoramboni. In this essay I wish to demonstrate which names were modified by the playwright, with special emphasis on the papal name, and prove that the pope’s name change was a meaningful, and probably conscious decision of the author. Later on, I am going to disprove some critics’ claim according to which Webster tried to hide some political criticism in this drama. Except for Isabella de’ Medici and Lodovico Orsini, all the names were transformed in the drama. The altered names can be divided in two groups: the ones which suffered only minor changes in their form, for instance Vittoria Accoramboni was changed into Vittoria Corombona, Paolo, Duke of Bracciano into Paulo, Duke of Brachiano, Flaminio to Flamineo. These alternations took place probably in order to make the pronunciation of the names easier for the English actors. The other group consists of more significant name changes: Francesco Peretti, Vittoria’s husband is called Camillo in the drama, Vittoria’s mother’s name instead of Tarquinia Accoramboni is Cornelia, Virginio Orsini in the drama becomes Giovanni Orsini, whereas the servant is called Zanche instead of Caterina. Whether these changes were conscious decisions of the author or not, it cannot be decided. Gunnar Boklund argues that these changes came into being by mistake. According to him, Webster read plentiful sources, i.e. the Fugger newsletter, the Chronicle of l’Anonimo del Campidoglio and A Letter Lately Written from Rome which contained too many complicated names and probably confused the young playwright, which lead to the alternation of names. This hypothesis is proved by the fact that Camillo was indeed a man in Vittoria’s life, though he was not her husband, but one of her brothers. The only character whose name has suffered both kinds of changes mentioned above is the historical Cardinal Montalto, later Sixtus V who in the drama is Cardinal Monticelso, and chooses the papal name Paul IV after his election. To explain the change from Montalto to Monticelso is rather simple, as it is due to only a corruption of manuscripts: probably while it was being copied, the original name, Mont’alto was altered, as the first t’ was mistaken for a ti, the a for a ce and the second t for a long s. But to find a reason for the papal name change seems to be more difficult, Boklund, for instance, does not even make an attempt to give an answer for it, even though it is highly improbable that the playwright simply confounded the papal names, as every source mentioned only Sixtus V.
In what follows, with the description of the historical Sixtus V’s and Paul IV’s papacy, I wish to prove that Webster changed these names in order to criticise more harshly the Catholic Church and to recall negative memories in the English audience. Felice Peretti, Cardinal of Montalto ascended on the papal throne on the 24th April, 1585 choosing the name Sixtus V. The ”iron pope” was well-known of his rigidity and severity, for years he was the main inquisitor of Venice. During his papacy he firmly fought against Protestantism, and supported financially the Spanish Armada’s attack on England. Even if Pope Sixtus V was called the ”iron pope” and helped the Spanish against England, the name of Pope Paul IV recalled more fearful and negative memories in an English audience. Gian Pietro Carafa was elected on the 23rd May, 1555, and reigned only for four years, until 1559. Therefore, Vittoria Accoramboni could not have known him, since she was born in 1557. Paul IV had a very bad reputation among his contemporaries, for example, Ignatius of Loyola was said to tremble in every bone in his body when he learned aboutCarafa’s election. This negative opinion did not alter later on, he is considered to be one of the most zealous and fanatic popes in history. Richard McBrian in his book describes him as an “authoritarian, triumphalistic, censorious, and intolerant” leader of the Catholic Church. Even though the Lutherans tried to reconcile with Catholics and the Vatican, he was rather hostile to them and refused cooperation. He helped Queen Mary I of England to re-Catholicise the country, and when she died in 1558, he insisted on the restitution of all church properties and demanded that Queen Elizabeth I submit all of her claims to him. After Paul IV death, riots broke out in Rome, a statue of him was thrown into the Tiber and rather offensive poems were written about him. Having described the character and papacy of both Sixtus V and Paul IV we may claim that the main reason for the pope’s name change is due to the fact that Paul IV was generally known to be a strict and rather cruel leader of the Catholic Church, what is more, was in great confrontation with England. Therefore, with this name change Webster recalled a well-known ruthless figure from the recent past. There are two more possible explanations why the name Paul was chosen by the author. It may have evoked another negative experience for the English with the Vatican, because it was Paul III who excommunicated Henry VIII, while Paul V was sitting on the papal throne when Webster wrote The White Devil. The real-life Paul IV was as ruthless and cruel as the literary character in the drama. Cardinal Monticelso of the drama seeks power and vengeance from the beginning of the play, and has a very strict and rigid world view: “It may be objected I am dishonourable / To play thus with my kinsman; but I answer, / For my revenge I’d stake a brother’s life, / That being wronged, durst not avenge himself” (Act II Scene I). According to the majority of literary scholars, and also as Linda Woodbridge describes in her book entitled English Revenge Drama. Money, Resistance, Equality, revenge tragedies were usually written with the intention of criticising the political and judicial system of the time. In order to avoid censorship, these dramas were set far away from England, usually in Spain or Italy. The latter country was generally regarded to be hypocrite, corrupt and merciless where only Machiavellians lived. According to an old proverb of the time ”Inglese Italianato è un diavolo incarnato,” i.e. ”An Englishman who assumes the Italian habit is a devil in flesh.” As John Symonds argues in his book, only the incidents of Italian history were capable of supplying drama writers as Webster with a proper type of plot for a lascivious revenge tragedy. Some scholars like John Russell Brown and Katherine Carey assume that John Webster did not only intend to retell the story of a famous Italian murder-series, but tried to formulate a criticism of England under the cover of Vittoria Accoramboni’s life and death. The most criticised character of the drama both by the other characters and literary scholars is Cardinal Monticelso, the later Pope Paul IV, as he is the most corrupt among all the characters. Being the head of the State of the Vatican and the Catholic Church, Brown and Carey compare him with the ruling English monarch of the time, both head of state and church, King James I, and claim that Webster meant to create an immensely corrupt and immoral court-situation in The White Devil, which alludes to the court of James I. The Italian setting, with its detailed allusions to Italian families, men of religion and political leaders, ceremonies and day-to-day habits and procedures, was a pretence that allowed Webster to evade the strict censorship that had landed Ben Johnson and other dramatists in prison for showing too clearly their criticism of King James I. and of his family, favourites, ministers and courtiers – the apparatus of authority in England. This black book contains the names of all the villains of Rome, from usurers to murderers of whom the pope-to-be Monticelso wants to do away once elected. Such a book, which is similar to a long death-list, was published also by the real Paul IV. It was his papal Index Librorum Prohibitorum, the so-called Index of Forbidden Books in 1559. The authors whose names were on the list were not only punished by the ban on publishing their works of art, but very often were regarded so harmful for the Church and society that they were persecuted and, in the end, executed. King James I. also had a similar black book, entitled Daemonologie which was published in 1597. In the book various magical creatures, witches, wizards of the island are described in detail. The king claims that these creatures exist in human forms and regards them dangerous, therefore urges the readers to search for and exterminate them. Though the book does not contain names of people as the historical and literary pope Paul IV’s black books, as Julian Goodare mentions in his essay, the Daemonologie was often used as evidence during witch trials, and was indirectly responsible for the death of many people. This explanation, however, seems to be hardly convincing. Could Webster’s audience have recognised such a subtle allusion to the king in the character of the pope? Was the playwright himself so interested in and at the same time against the politics of James’s court to write a tragedy to criticise him? The answer for these questions is a clear ”no”, especially because no sources were found about John Webster’s opinion on politics or the king’s reign. Consequently, we can prove it does not follow necessarily that the character of the pope was intended to be a criticism for the king, and that is the reason why the papal name change was not affected by it. However, we can claim that the pope’s name change was a meaningful decision of the author to render the literary character more fearful and repugnant in the eyes of the English audience, and to recall negative experiences from the past which are connected only to him. Webster, John. The White Devil. Edited by Elizabeth M. Brennan; London: Benn: The New Mermaids, 1966. The Scottish Witch-Hunt in Context,ed. by Julian Goodare, Manchester University Press, 2002. Boklund, Gunnar. The Sources of the White Devil. 1957th ed. Nendeln: Kraus Reprint, 1976. McBrien, Richard. The Pocket Guide to the Popes. HarperCollins Ebooks, 2006. Moody Carey, Katherine Jeanette. John Webster’s The White Devil: A Literary Artifact of the Jacobean Struggle for Power by King, Pope, and Machiavel. A Dissertation Submitted to the Graduate Faculty of The University of Georgia in Partial Fulfillment of the Requirements for the Degree; Athens: University of Georgia, 2006. O’Malley, John W. A History of the Popes, From Peter to the Present. Plymouth: Rowman & Littlefield Publishers, 2010. ”Daemonologie” In: King James I. and VI. : Selected Writings. Edited by Neil Rhodes, Jennifer Richards, Joseph Marshall, Ashgate Publishing, Ltd., 2003. Symonds, John. Sketches and Studies in Italy and Greece. Gutenberg Project; „1248153909.pdf”, nd. Webster, John. The White Devil. Ed. by John Russell Brown, Manchester: Manchester University Press, 1996. Woodbridge, Linda. English Revenge Drama. Money, Resistance, Equality. Cambridge: Cambridge University Press, 2010. Gunnar Boklund. The Sources of the White Devil. 1957th ed. Nendeln: Kraus Reprint, 1976. and R. W. Dent. John Webster’s Borrowing. Berkeley: University of California Press, 1960. pp. 54-59. For further information on name changes see the Appendix. Cf: Gunnar Boklund. The Sources of the White Devil. 1957th ed. Nendeln: Kraus Reprint, 1976. pp. 133-145. John W. O’Malley. A History of the Popes, From Peter to the Present. Plymouth: Rowman & Littlefield Publishers, 2010., p. 215. According to some sources ’Giampietro’. Cf: John W. O’Malley. A History of the Popes, From Peter to the Present. Plymouth: Rowman & Littlefield Publishers, 2010. p. 204. Richard McBrien. The Pocket Guide to the Popes. HarperCollins Ebooks, 2006. p. 261. Cf: Ibid. and John W. O’Malley. A History of the Popes, From Peter to the Present. Plymouth: Rowman & Littlefield Publishers, 2010., p. 205. 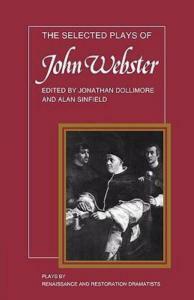 John Webster. The White Devil, ed. by Elizabeth M. Brennan, London: New Mermaids, 1966. p. 43. Cf: Linda Woodbridge. English Revenge Drama. Money, Resistance, Equality. Cambridge: Cambridge University Press, 2010. John Symonds.. Sketches and Studies in Italy and Greece. Gutenberg Project; “1248153909.pdf”,nd., p. 181. Cf: ”Introduction” in: John Webster. The White Devil. Ed. by John Russell Brown, Manchester: Manchester University Press, 1996. Katherine Jeanette Moody Carey. John Webster’s The White Devil: A Literary Artifact of the Jacobean Struggle for Power by King, Pope, and Machiavel. PhD Thesis, University of Georgia, 2006. ”Introduction” in: John Webster. The White Devil. ed. by John Russell Brown, Manchester: Manchester University Press, 1996., p. 5. John Webster. The White Devil, ed. by Elizabeth M. Brennan, London: New Mermaids, 1966. p. 73. Cf: The Scottish Witch-Hunt in Context,ed. by Julian Goodare, Manchester University Press, 2002. p. 60. * This paper was written for and during a seminar entitled "History of Literature and its Contexts" held by Zsolt Almási and János Barcsák in 2011.